We are returning to the beautiful local winery, Great Frogs, for a fabulous evening of great wine, great food, and great company... all with a local flair. We are to celebrating the upcoming Buy Local Challenge Week (July 23-31). Hence our theme: Drink Local. Eat Local. Support Local. 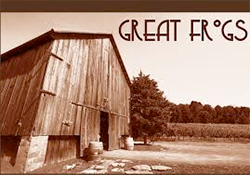 With regard to wine, you can't get much more local than Great Frogs Winery. It's Annapolis' only winery... located in a bucolic location - just off Forest Drive - that makes one forget it's only minutes from downtown.